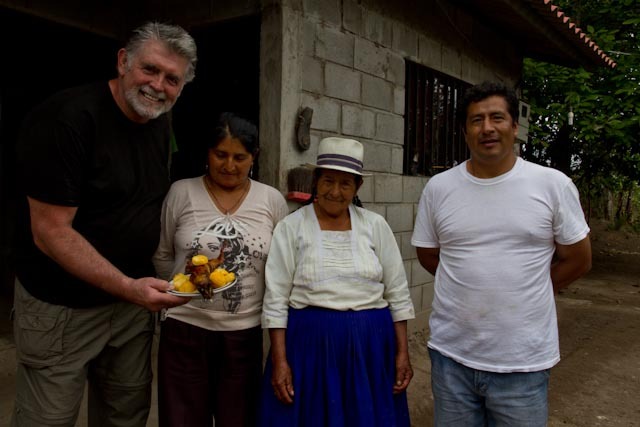 living in Cuenca Ecuador - Meeting New Friends! I met Sandy via e-mail back in October, when we were trying to find out which documents were required by Ecuador to apply for our visas. She and I continued to stay in touch when she told me she would be visiting during the Christmas holiday. Well, we finally got to meet today! 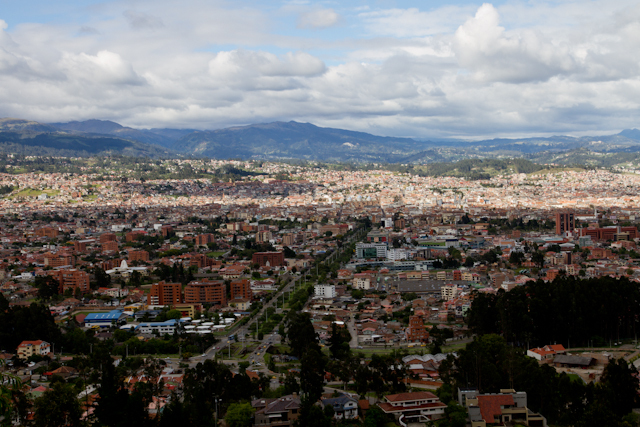 Sandy lives in Jacksonville, Florida, and she is hoping to relocate to Cuenca someday! For now, she told us how much she was enjoying her three week visit in this beautiful city. 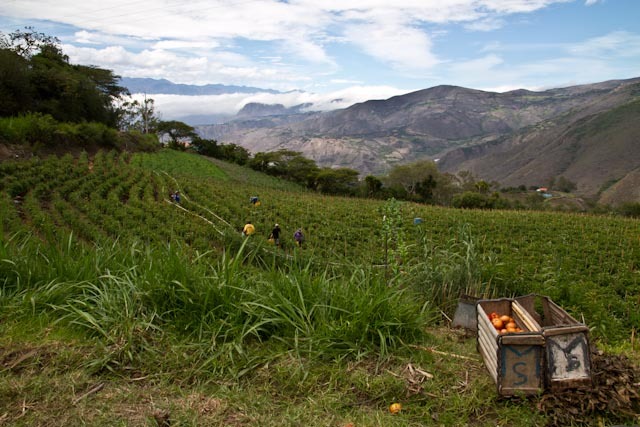 I encouraged her to continue studying and practicing her Spanish because it is going to make life so much richer and more interesting for her here if she can come with the ability to communicate with the Ecuadorians. 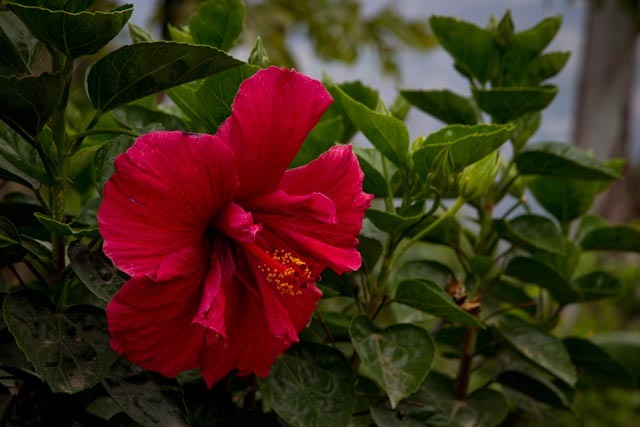 I am thankful for my ability to understand the language and to be able to communicate with the people while living here, and I would find it very frustrating and isolating if I didn't know Spanish. 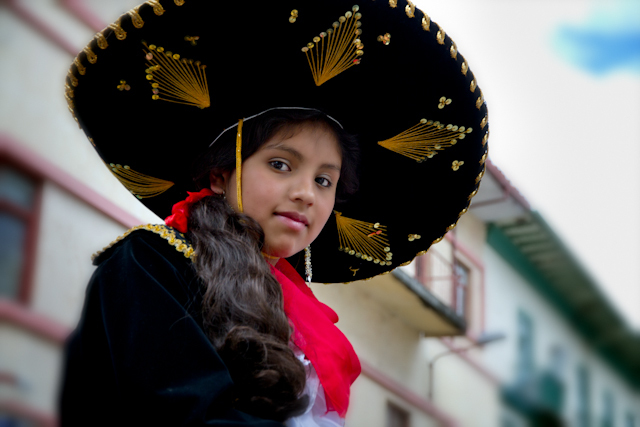 Sandy took a week worth of Spanish immersion at the Simon Bolivar Spanish School, and she said she loved it and it was helpful for her. I think she's serious about coming back to live here someday! 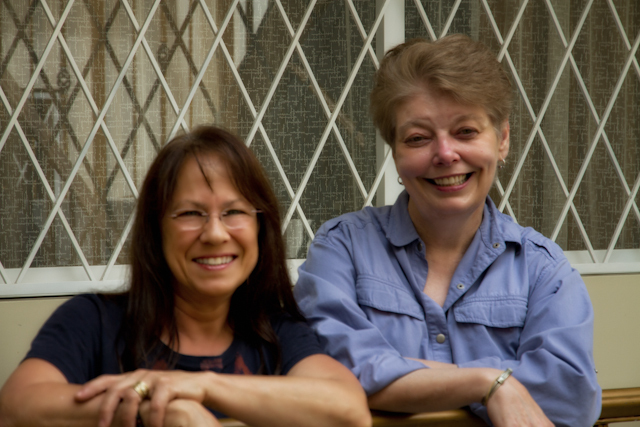 We will continue to stay in touch, and we hope to get together with Sandy one more time before she heads home on January 3rd. For now, she is loving visiting and exploring her possible future home and making new friends. We're glad we had the opportunity to spend time with our new friend! Sandy came to visit us at our apartment. She is staying at a hotel only a few blocks from us in El Centro. The location is great because she can go right out her door and be in the bustle of this alive and beautiful city. After breakfast, we strolled along the vendor displays. 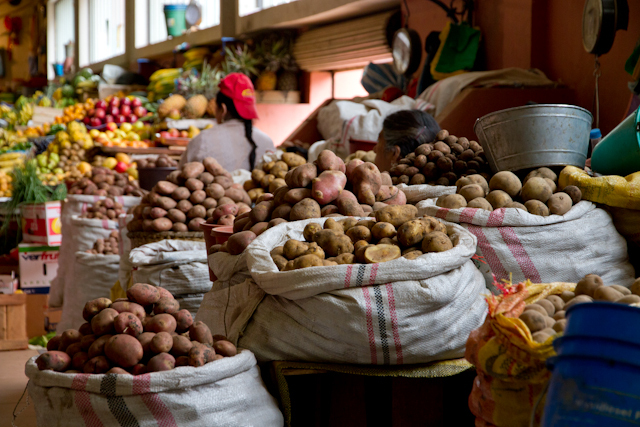 Some vendors sell only one type of produce, such as potatoes or legumes, and some sell a variety of vegetables and/or fruits. 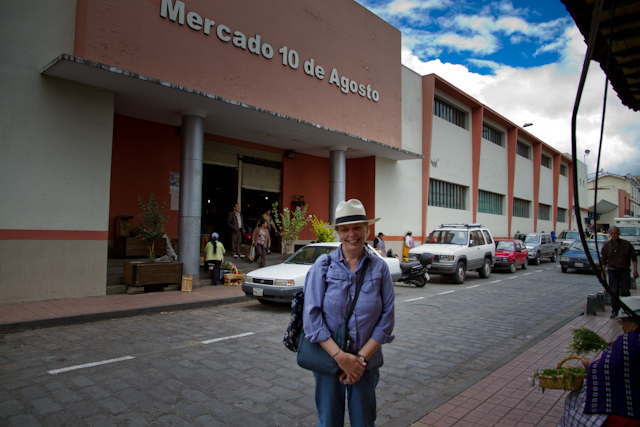 Bo and I shop daily and fresh, and we never get tired of visiting El Mercardo and seeing some of our now favorite vendors. 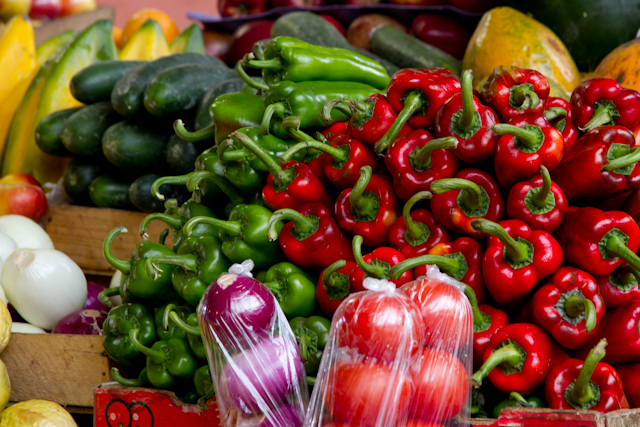 One can purchase individual vegetables and fruits or by the bag. 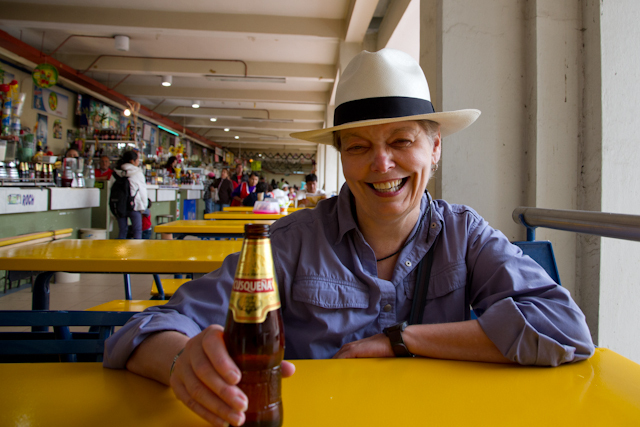 We have learned some of the prices, so we aren't overcharged "gringo" prices. 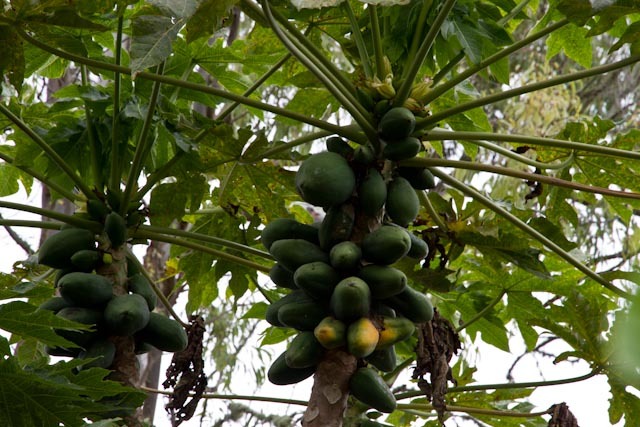 Because we buy daily and fresh, it's fun, for example, buying an avacado, and having the vendor pick one that is perfect for the evening meal. 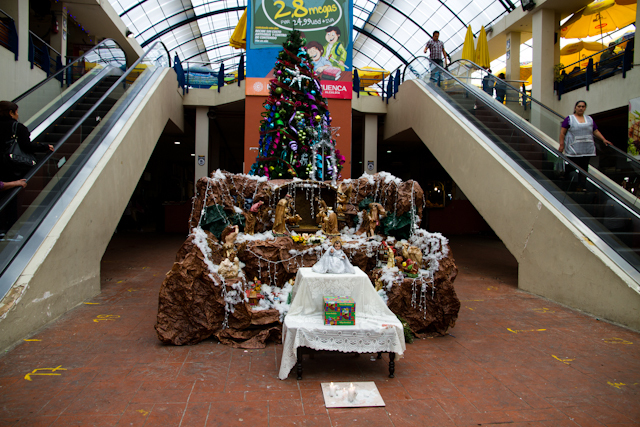 A Christmas Nativity display at the main floor of the market is honored with a tray of lit candles in front. 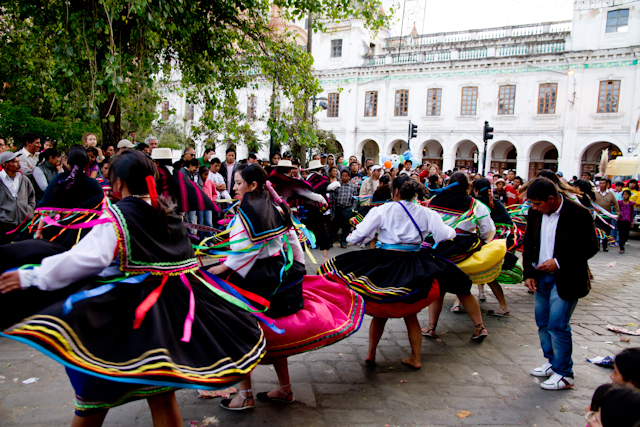 The Ecuadorian community is getting ready for their New Year celebration which will be another grand party in the streets of Cuenca. 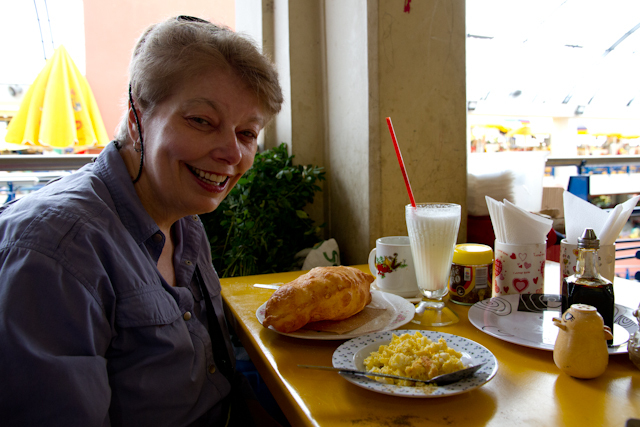 After our time at el mercardo, Sandy is now ready to go get a cell phone, and then we are off to tour the city on a double-decker bus! It cost $5 for a two-hour bus tour. How much do you think this would have cost in a large city in the US? That's Anthony in front of Bo. 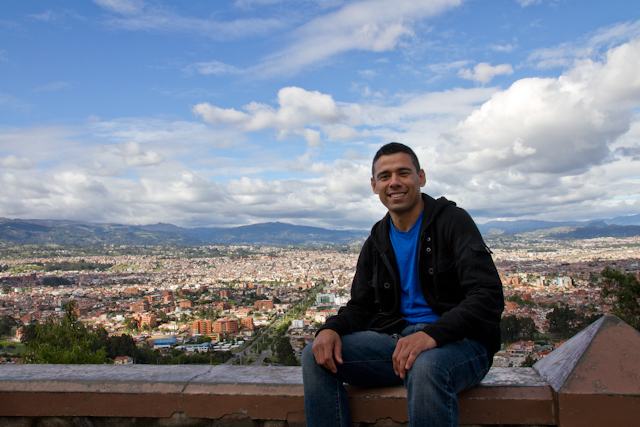 He lives in Corvallis, Oregon and was visiting Ecuador on his Christmas break from Oregon State! 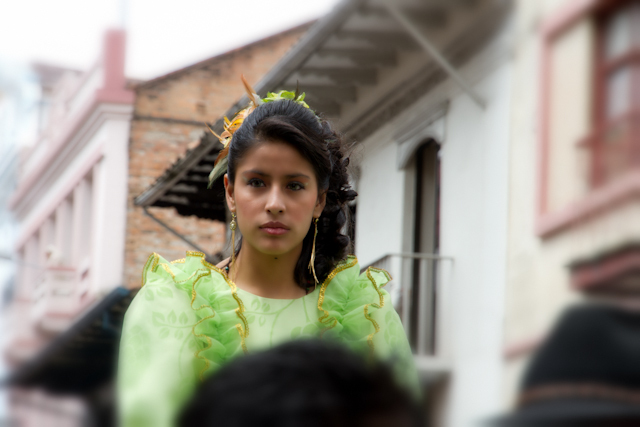 It's a small world in Cuenca, and it's fun meeting new and interesting people. We all have a story to tell! 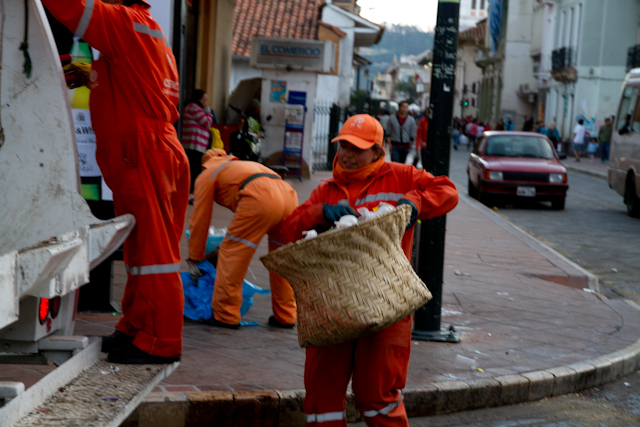 There are many "tienditas" (little stores) along the streets of Cuenca. 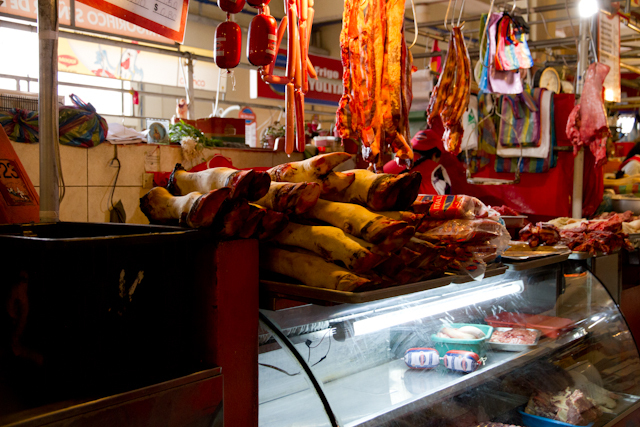 We love shopping for everything right in our city and not having to go to the larger Super Maxi grocery stores which are outside of the El Centro area and so much more expensive. 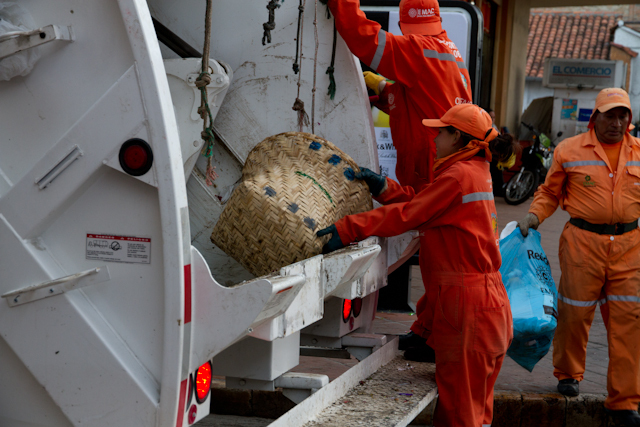 We purpose to support the hard-working vendors and store owners in our city. So far we've been able to find locally almost everything we need for our cooking and household. 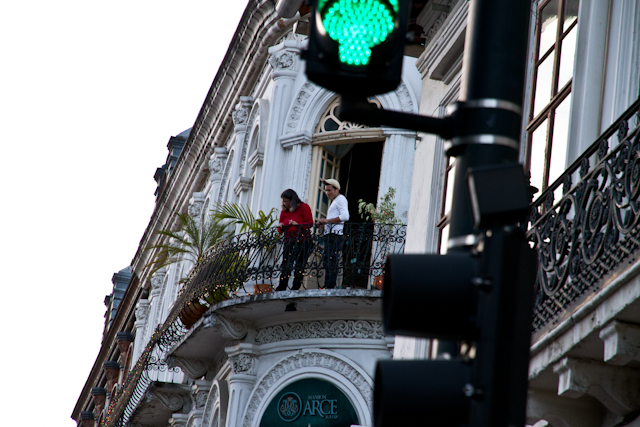 It was interesting seeing the city from a two-story bus - being out in the open and taking photos of the old and beautiful rooftops and balconies. The weather couldn't have been more perfect for our tour! Blue skies with huge fluffy clouds, and a clear view of the surrounding mountains. This is the Rio Tomebamba - which separates the old and new parts of the city. 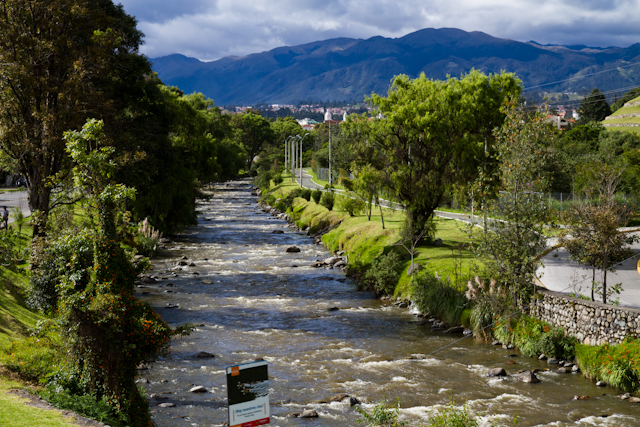 it is one of four rivers that runs through Cuenca! 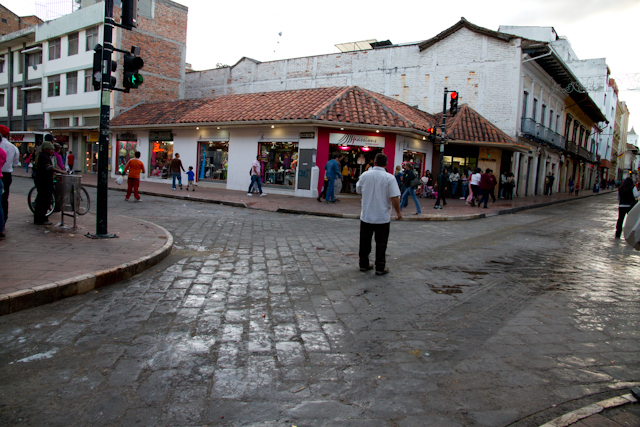 There are no yield signs or dividing lines in the streets of Cuenca. Yet, there seems to be a smooth transition between each vehicle amidst the occasional honking of horns. Pedestrians DO NOT have the right of way, and we're becoming experts at crossing streets and dodging the fast-moving cars, taxis, and buses! 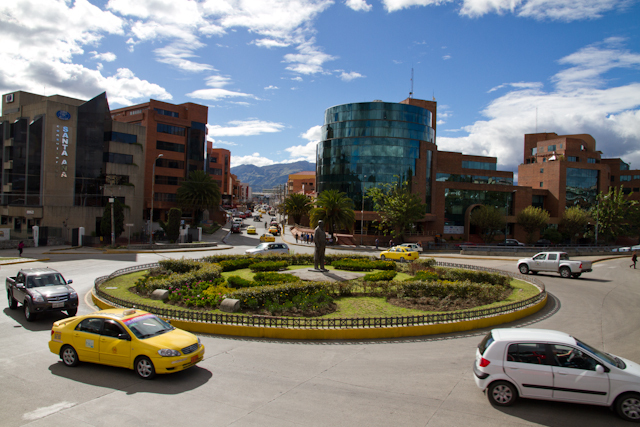 The tour bus goes all the way up to Turi (a town and parish in Cuenca). 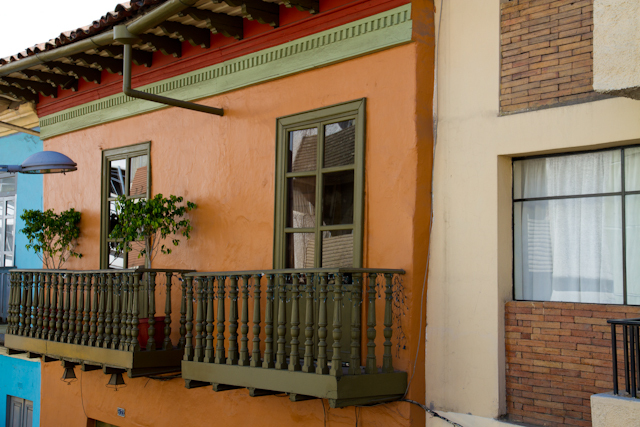 It is perched on a hill overlooking the beautiful city. Anthony will be returning to Corvallis, Oregon after the New Year. Perhaps we will meet again! 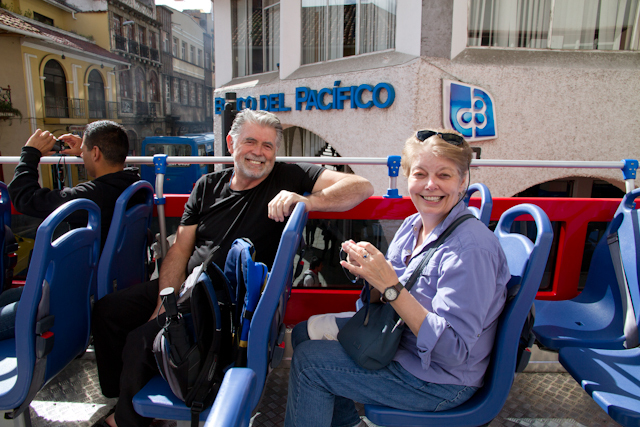 The bus returned us to Parque De Calderon, and we bid farewell to Sandy and another beautiful day in Cuenca. We hope to see her one more time before she returns to her Florida life. 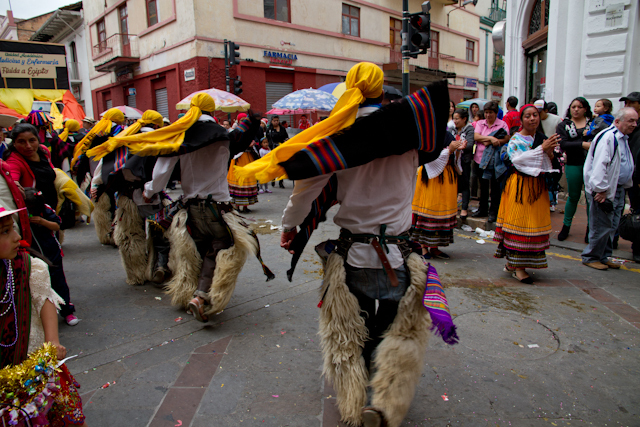 living In Ecuador - CUENCA'S ALL DAY PARADE!!! 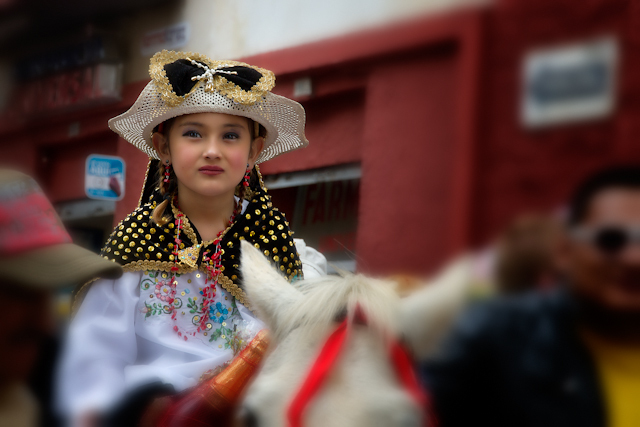 Today was Cuenca's all-day parade called "Pase Del Nino." What an amazing and unique day it was for us! 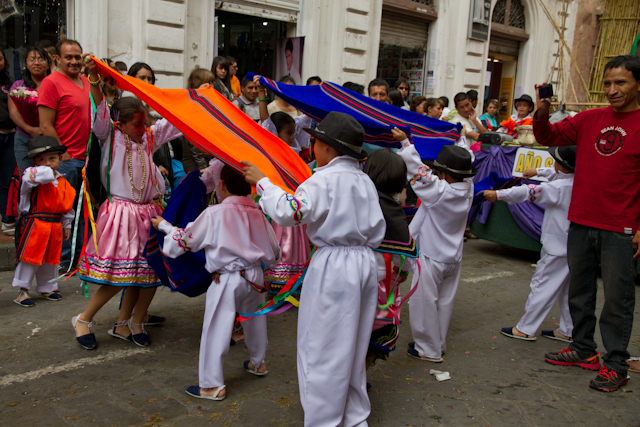 With camera in hand and only a two block walk from our apartment to Calle Simon Bolivar, we were able to plant ourselves for hours and observe a most grand celebration by these partying religious Ecuadorian people. 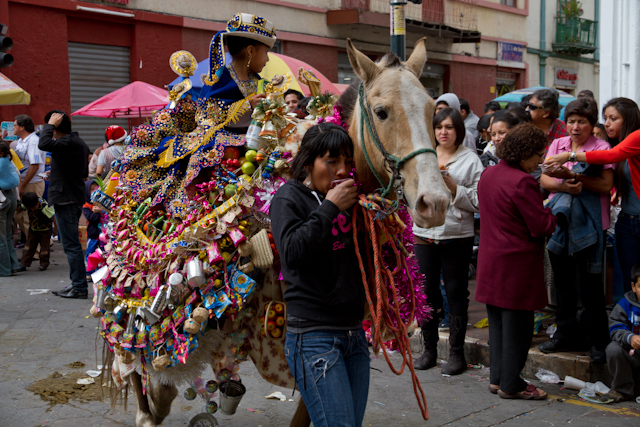 This eight-hour plus procession had the most creative and colorfully decorated vehicles, horses, adults, children, pets, and floats. 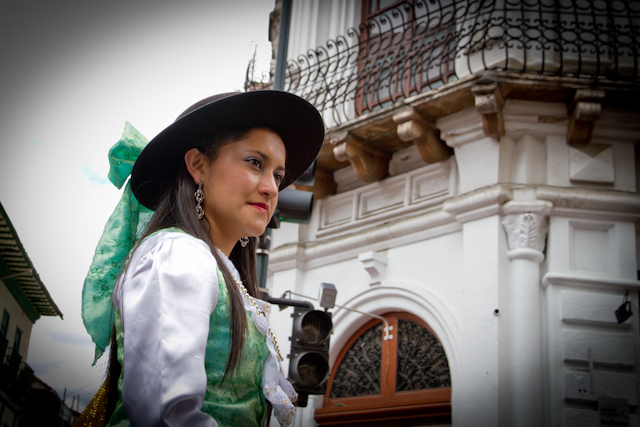 there were bands, stilt-walkers, dancers, and latin music along the narrow cobbled streets. 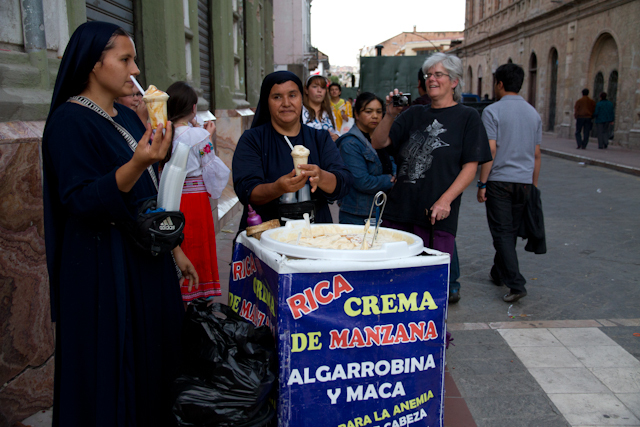 Crowds lined the Bolivar, and vendors cried out with sweet and cold drinks, traditional foods, cotton candy, ice cream, and various wares for sale. 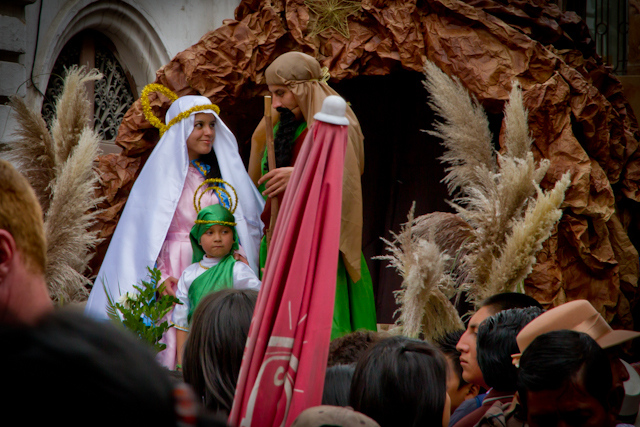 The theme was the Catholic infant Jesus being carried through the peoples' town. It is written that over 50,000 people participate in the parade, and more then 200,000 observers watch from the sidewalks, balconies, and rooftops. 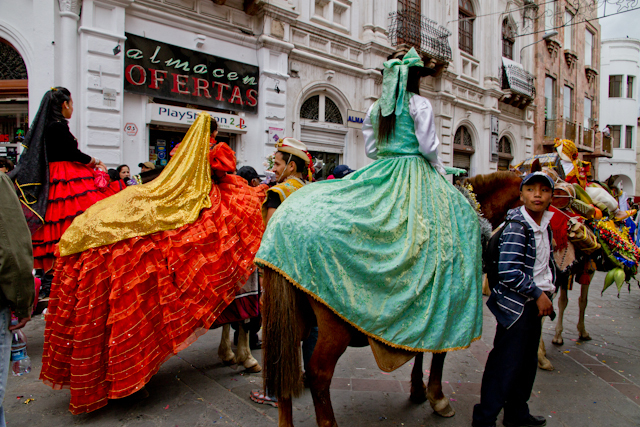 This is also a three-month-long celebration which extends to early March when Ecuadorians celebrate "Carnival." A high alcohol content drink called Chicha was also being handed out, free, which is their traditional holiday beverage. Bo and I didn't get to sample this drink, but I read that it is very bitter and not tasty at all. 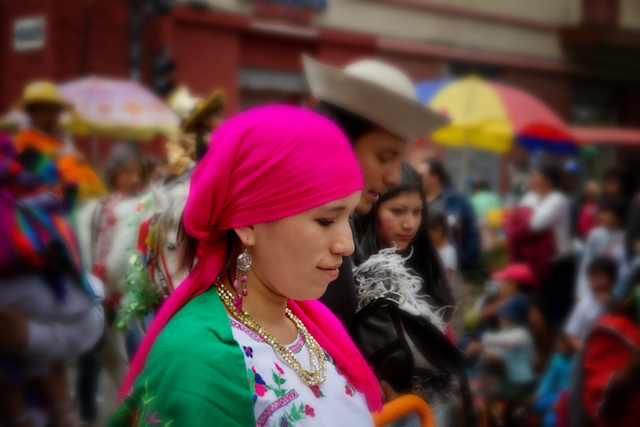 My photography delight was seeing and capturing the families together walking the streets or riding in floats and vehicles with their adorned beautiful children. 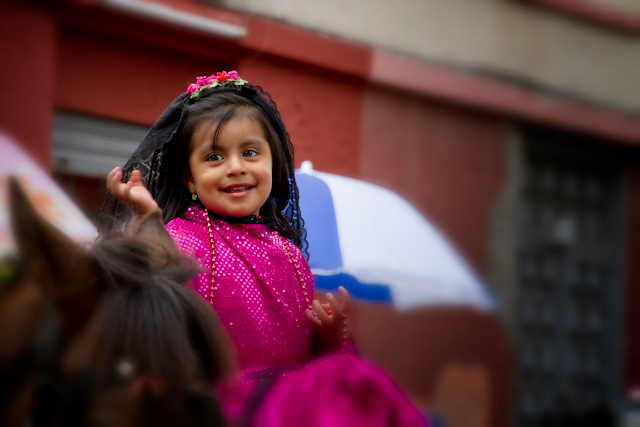 Their satiny dark skin, shiny charcoal eyes, and thick long dark hair stood out in their colorful and bling-adorned costumes as they proudly flaunted their religious belief and dedication to this relgious celebration. We were able to walk back to our apartment to take several breaks from this festivity. 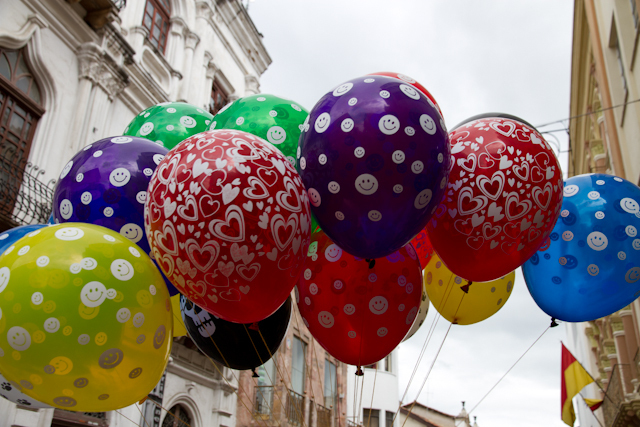 Never before have we experienced a day long parade with so much energy and festivity on the streets of a city. There was such joy, laughter, music, song, and dance all day long, and it was a wonderful experience for us as newcomers to this unique and vibrant city. At 3 pm, we were back at our apartment, and via Skype we were able to see and talk to our mom. The care facility had her all dressed up in her Christmas outfit, and she looked wonderful and our conversation was sweet and precious. At 87, Mom's dementia is slowly advancing, but she still knows her children. I cried saying goodbye to her, knowing I can't just drive over to see her and spend Christmas Day with her this year. However, I continue to rest in the fact that she is in a loving place with loving care, and I know they will make her Christmas special. I hope our readers will enjoy some of the special photos I took of this day's festivities. 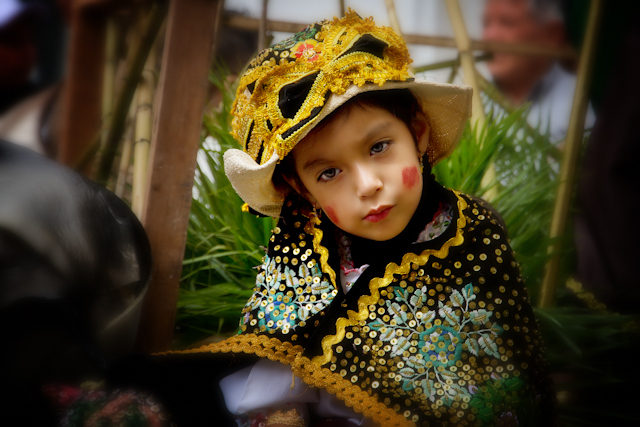 It won't be the same as watching the parade live, but at least it will give you a glimpse of how grandly Ecuadorians celebrate, and how serious they are about their creative costumes and parades and festivities. 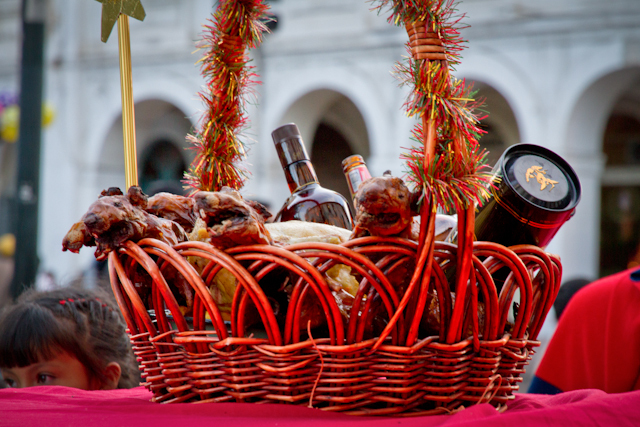 MANY OF THE FLOATS, HORSES, VEHICLES, AND WALKING PARADERS CARRIED CHANCHO (ROASTED PIG), ROASTED CUY (GUINEA PIG), POLLO (CHICKEN), AND OTHER FOOD GIFTS. IS THAT CHICHA HE'S SIPPING??? 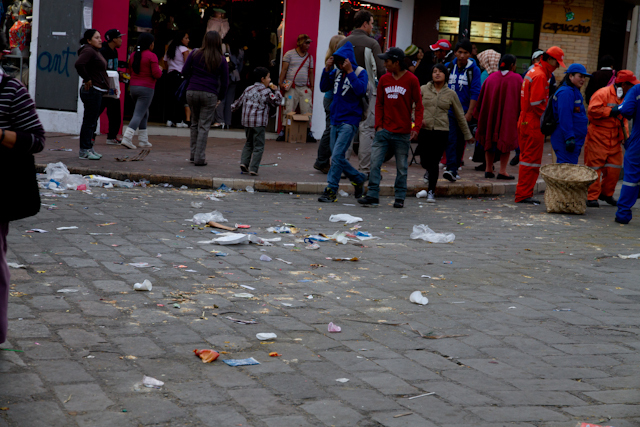 By evening, the streets were lined with "basura." 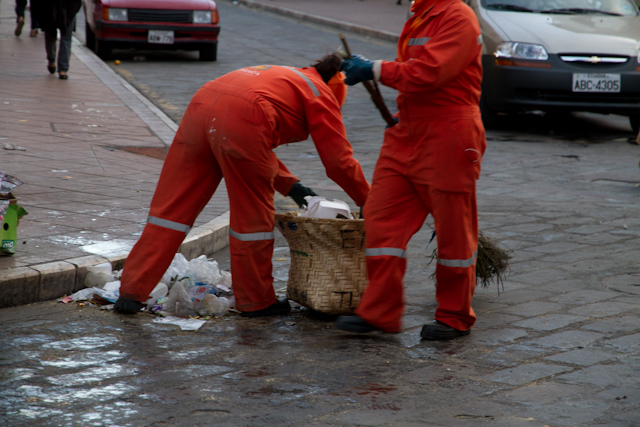 CUENCA IS A CLEAN CITY, THANKS TO THE BLUE AND ORANGE MEN AND WOMEN! 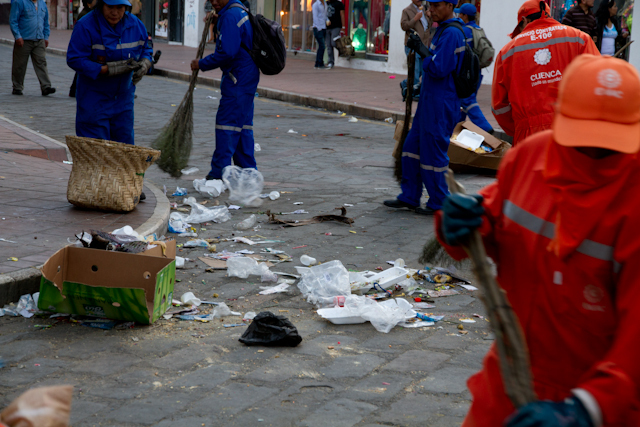 .....as the water truck drove by and finished the clean-up task. ......and in less than 5 minutes the streets along this corner were immaculately swept and washed down! This evening, on the way home, we stopped and bought a postre (dessert) and took it to Sr. Diaz. We wanted to wish him a "Feliz Navidad." He was sitting at his shoeshine home eating a simple bowl of rice. It was sweet seeing him light up as he took the dessert and shook our hands, thanking us with such gratitude. A simple gesture meant so much to him (and to us)! Tonight and tomorrow, some will be celebrating Christmas with family and friends, and some will be all alone. Some will be celebrating through their religious beliefs, and some will be celebrating with a special meal and gift exchange. Some will remember with heart-felt gratitude Jesus Christ as their Risen Savior, and some will scoff at the name of Jesus. Tonight and tomorrow, Bo and I are thousands of miles away from our family and friends, but we will be celebrating our Risen Lord and Savior together. We have so much to be thankful for apart from the material world of stuff. We have each other, our health, and a new City to explore and learn about. We have new friends we've made here, and we'll meet new friends as we journey through this amazing country. We wish everyone reading about our Journey a blessed Christmas and a fruitful and blessed New Year ahead. 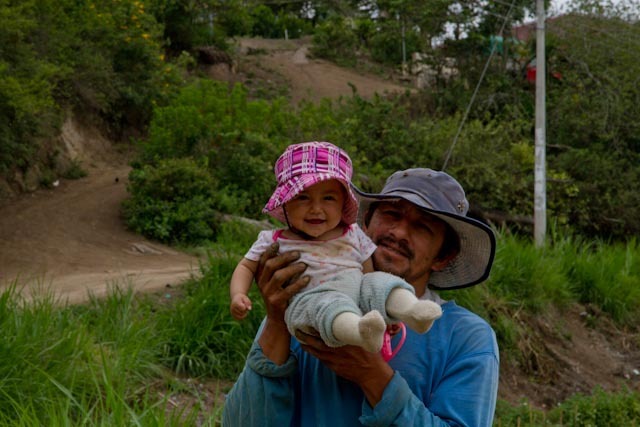 CHRISTMAS IN CUENCA ECUADOR - MEET PEDRO AND HIS FAMILY!!! We met Pedro at Sra. Marianetta's Juice Booth about two weeks ago. 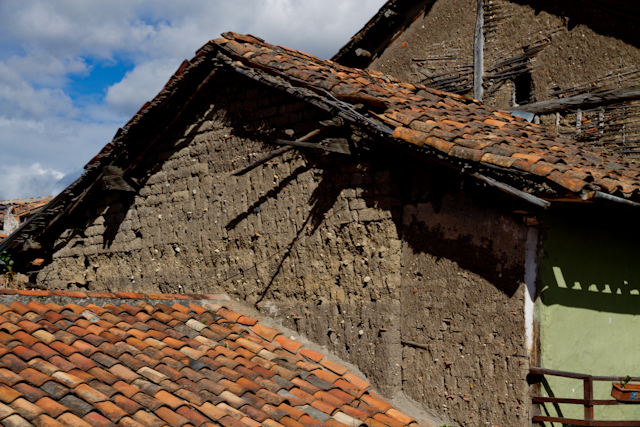 He sat at our table, and he and I conversed in Spanish about Cuenca. I asked him questions about his life. 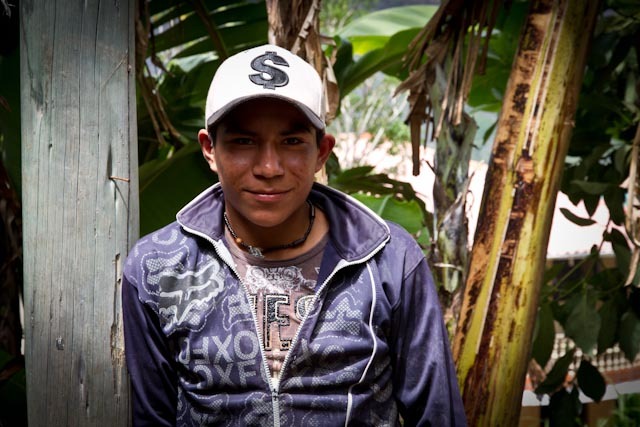 Pedro works as a long-haul truck driver in Cuenca, and he's studying for his high school diploma. 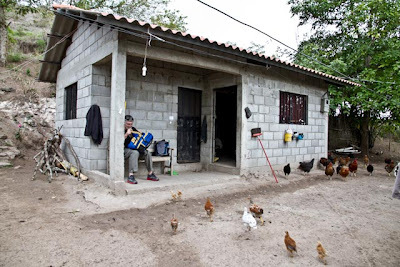 He told us that he lived in New Jersey for almost 10 years to earn money and then came home several years ago after the wonderful changes President Correa has made for his country and his people. On Saturday, we ran into Pedro again, unexpectedly, while on our morning walk. 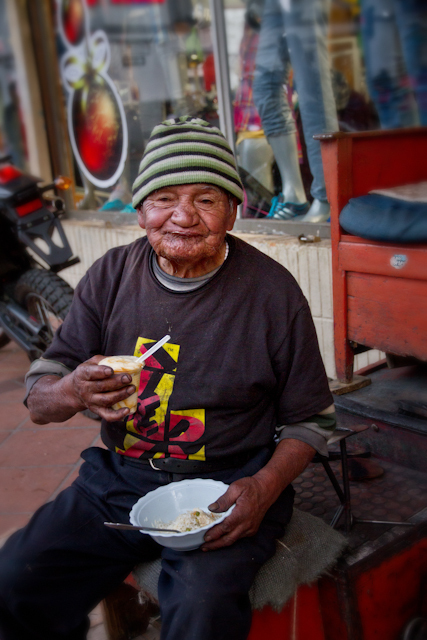 We stopped and chatted, and he then asked us how we celebrated Christmas back in the States and what we were doing for Christmas in Cuenca. Suddenly, he said (in Spanish, of course), "Come with me to Yunguilla. I'm going to see my family today, and I want you to come." He hadn't been home in over a year because of his work and studies. 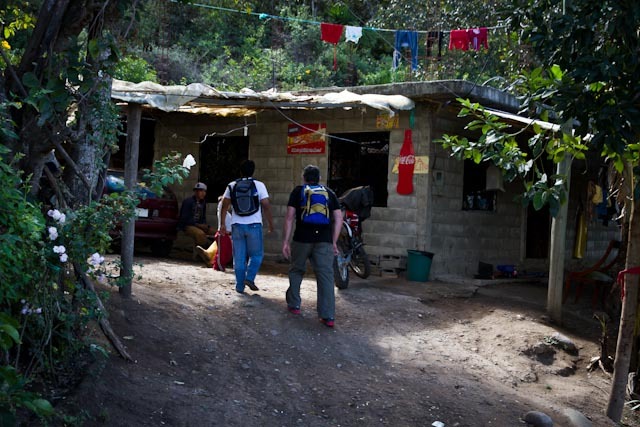 We accepted, went home to pack our backpacks, and before we knew it we were going to Dan Dan, a small community outside of Yunguilla, where he was born and raised and where his parents have lived all their lives. The bus was full, so a 12 passenger van picked us up for $1.50 each (and others along the way) and we headed for Yunquilla. 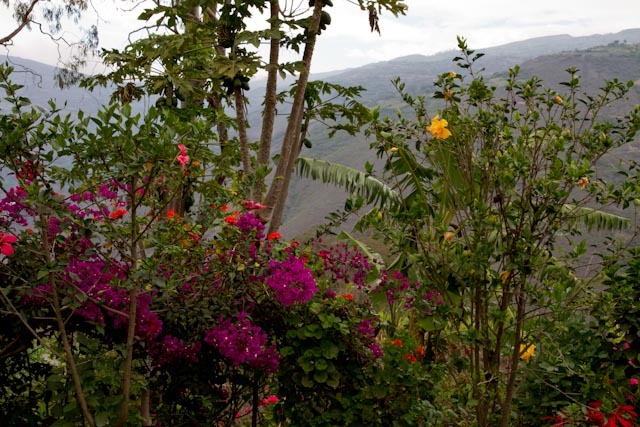 It was a beautiful ride, and we arrived in Yunguilla about 1 1/2 hours later. 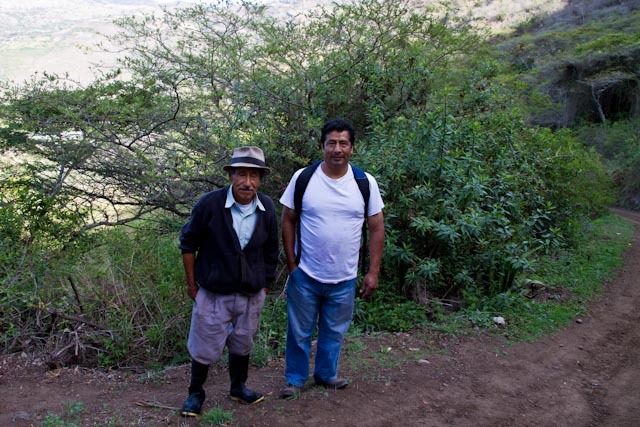 Pedro then called for a local driver who took us up a narrow winding mountain road (for 50 cents each), and about 15 minutes later we were on top of the world at Pedro's parents' home. It was two glorious days of being embraced by his family and community, a time we will never forget!!! Pedro, home at last and ON TOP OF THE WORLD!!!! This is a short walk below from where his parents' home is. 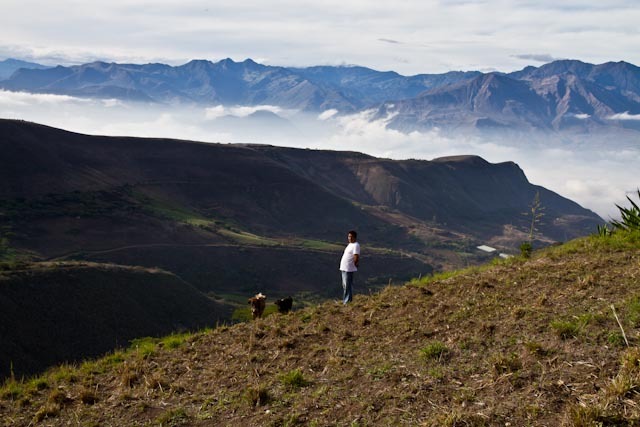 I can't describe the beauty and peacefulness we felt being this high in the mountains of Dan Dan. 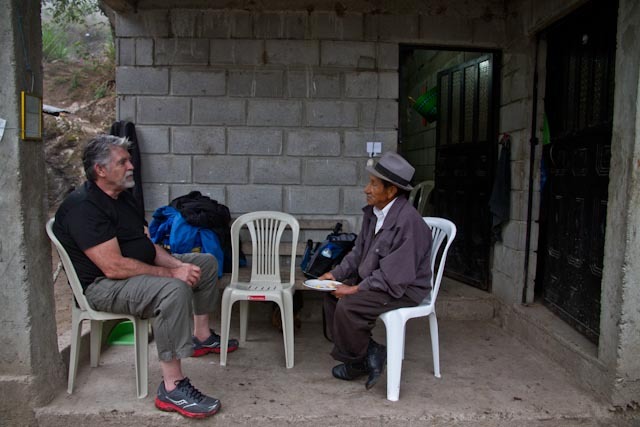 Bo, sitting in front of Pedro's family home. The room on the left is the kitchen. On the right is the bedroom. It is a very humble home with a lot of love. His parents gave us their bed for the night, and Pedro slept on a mat on the floor. They slept on a mat in the kitchen. 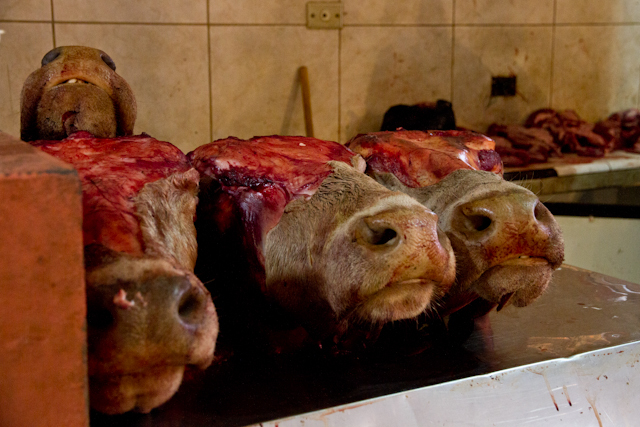 To refuse their kindness and hospitality would have been rude! Their water is pure and drinkable. 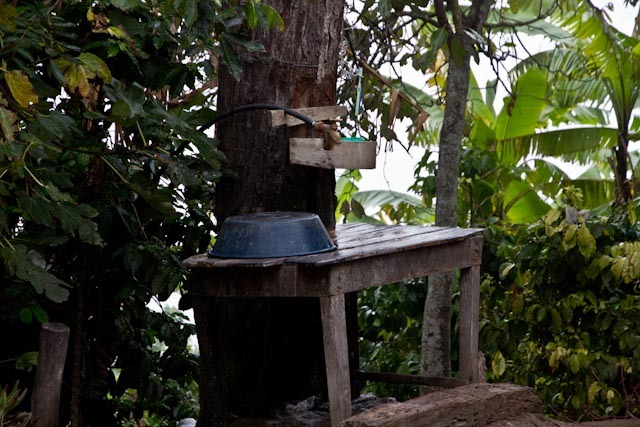 We would wash up outside at this washstand. Their outhouse has a flush toilet and electricity. 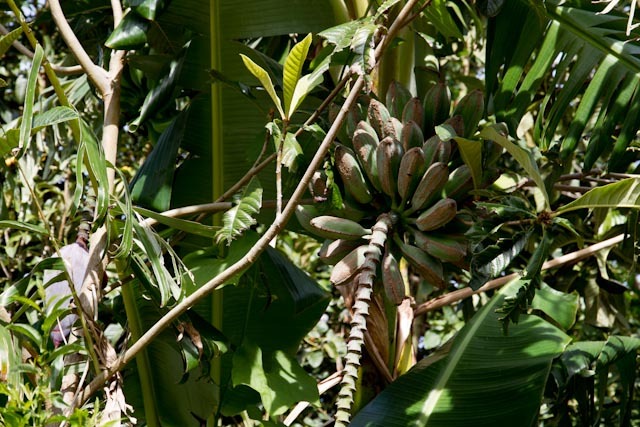 They grow all their food, and to the right of the washstand were abundant coffee plants. Their fresh ground coffee was delicious and we consumed much. We learned about Ecuadorian life and different and delicious Ecuadorian foods from Pedro's mom (his cousin Olga is behind Sra. Rosa). Pedro is holding a plate of Freshly cooked Camote and Yucca picked today from their producing land. To the left of the house is another building that is the original house on their land. Here, Olga is getting ready to cook us dinner on an outside propane stove. They raise cows turkeys, roosters, chickens, and Cuy (Guinea Pigs). 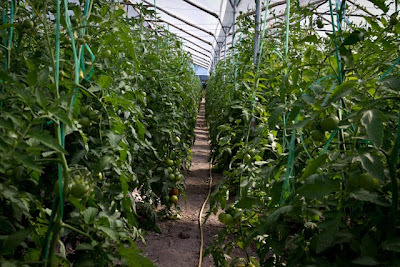 They also grow all their food and have over 10 acres of land that is producing abundant fruits and vegetables. 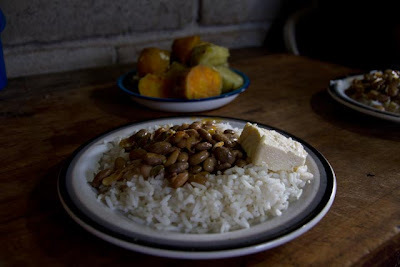 Breakfast on Sunday Morning was Camote (a delicious sweet potato), Yucca, Frijoles, Rice, and a chunk of cheese (Queso Molida). Sra. 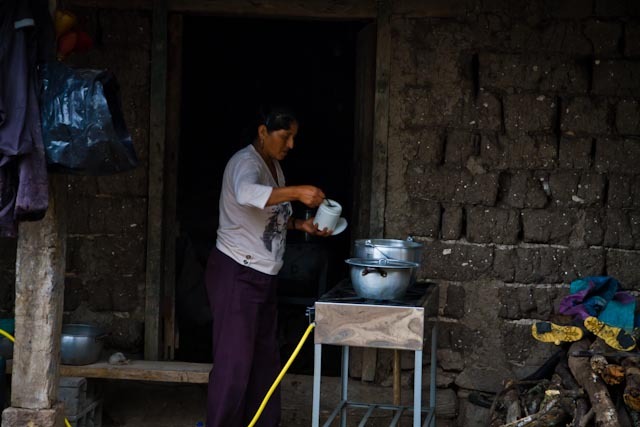 Rosa told us that a hearty breakfast is always served because they work all day and rely on this for their daily energy. 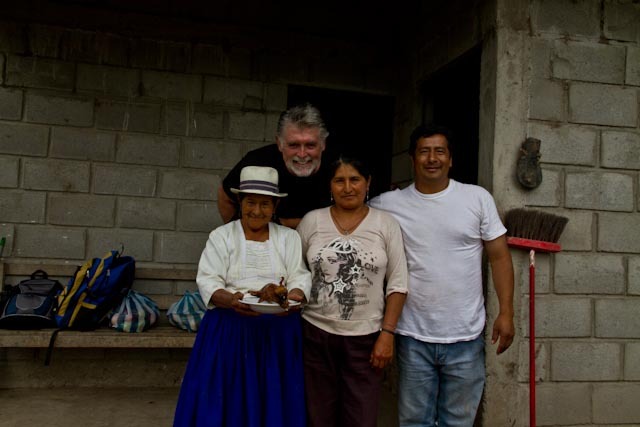 To watch Pedro's parents work from morning to night was very humbling! 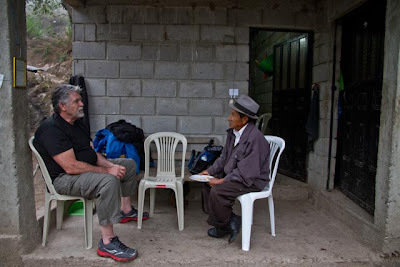 Sr. Salvador, Pedro's dad, enjoyed sharing childhood stories with Bo. He is 76, cannot hear very well, and he had no clue that Bo couldn't understand most of what he was saying. Bo listened and nodded and smiled. Sr. Salvador is holding a plate of tiny animal crackers and individually wrapped caramel candies, which is what they served as appetizers before our meal. 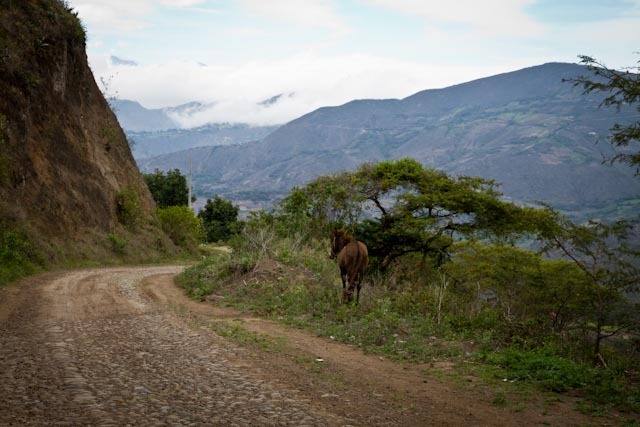 After breakfast, we walked on this cobbled and dirt winding road for miles and miles. (Its a good thing Bo and I have been climbing stairs for exercise, or we both would have died!!!) Pedro wanted to introduce us to his community of family and neighbors. He told us we were the first extranjeros (foreigners) he had brought home to his people. We were touched by the warmth and welcome we received as we met neighbors, cousins, friends, and family along the way. 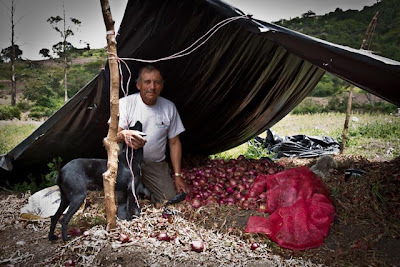 Pedro's cousin, Flora, is a tomato farmer. She has many greenhouses with the tallest and most abundant tomatoes we've ever seen. Her husband is in Connecticut working. She returned here five years ago with her two teenage children, but said her heart is still in Connecticut. Me, Flora, and Bo showing off Flora's harvest. Flora wants us to come back for a visit so she can prepare us a dinner of fresh caught Tilapia which she raises on her land. She is so kind and we enjoyed meeting her and touring her greenhouses. Her children were beautiful, polite and respectful. 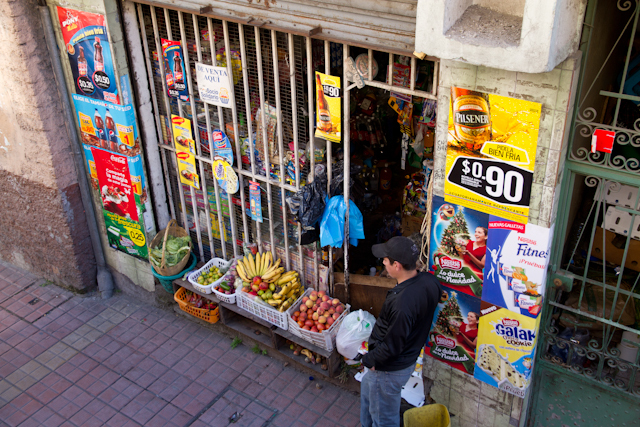 After miles of walking in sunny warm weather, we stopped at this Tiendita to buy some cold beverages and meet more of Pedro's people. 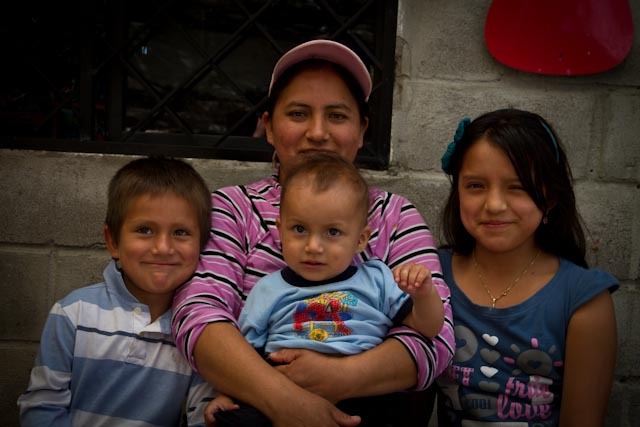 This is Marielena and her three children, whom she is raising while her husband is in New Jersey working. It's been over 6 months since she's seen him. Many of the women here are raising their children by themselves without their husbands. She runs this mountain store to provide for her children. This is Wilson. He is a friend of Marielena. He listened to our conversation and politely nodded and smiled the entire time. When I asked him if I could take his picture, he jumped up and was ready to pose. Everyone is excited for me to bring them copies of the photos I took. It was a rare experience for them to have their pictures taken. Along our walk, we ran into Sr. Salvador. Pedro does not have a photo of he and his father together. NOW HE WILL!!!!! 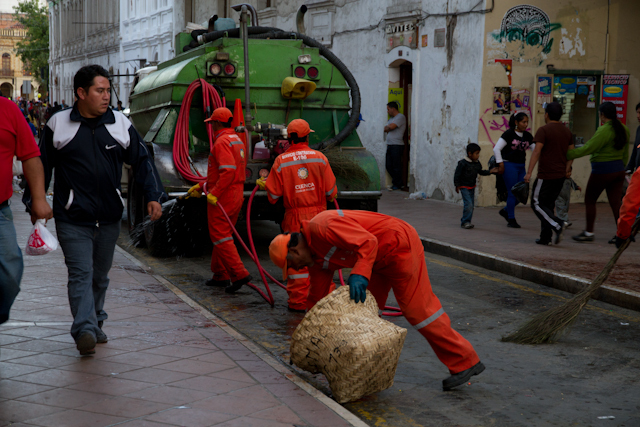 The Ecuadorians are a short statured people. Bo is "El Gringo Gigante." He receives a lot of stares, especially from children because of his size compared to this tiny people. Me, I feel right at home!!!! 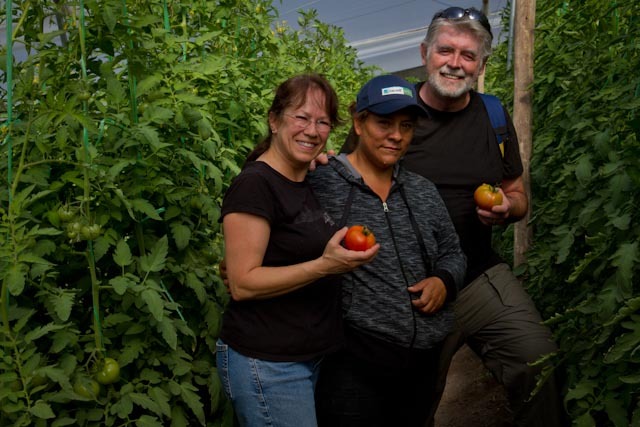 We continued our journey and came across another hard-working family in this beautiful community - Flora and her husband, Juan. 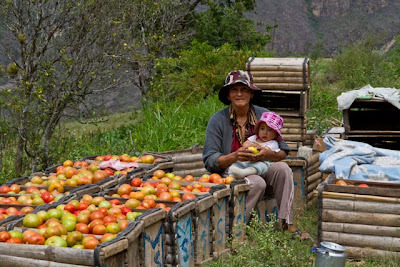 Flora was holding her baby while she sorted the tomato harvest with one hand. 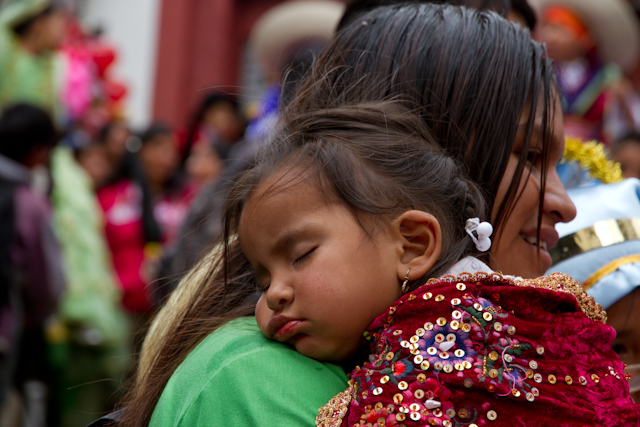 Children are right along side their parents, and every child and teenager we encountered extended their hand or cheek for an Ecuadorian cheek-to-cheek greeting. 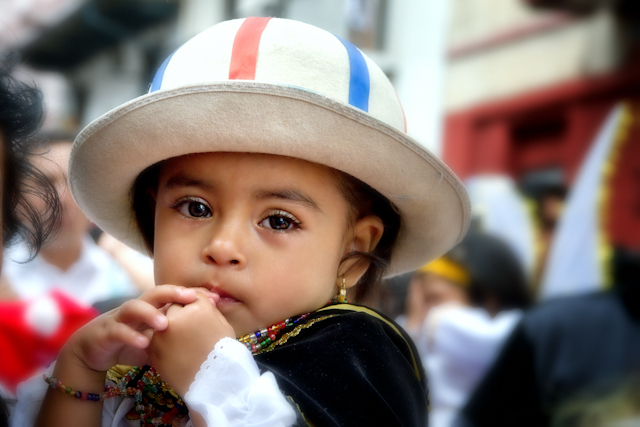 Ecuadorian children are respectful, kind, polite, and in awe of Gringos! Juan left his work in the fields to come and greet us. His is proud of his beautiful baby girl and is working hard to provide for her. We were given a huge bag of plump, red, juicy tomatoes to take home with us as a gift. We bid farewell to another kind and giving family as we continued on our journey. 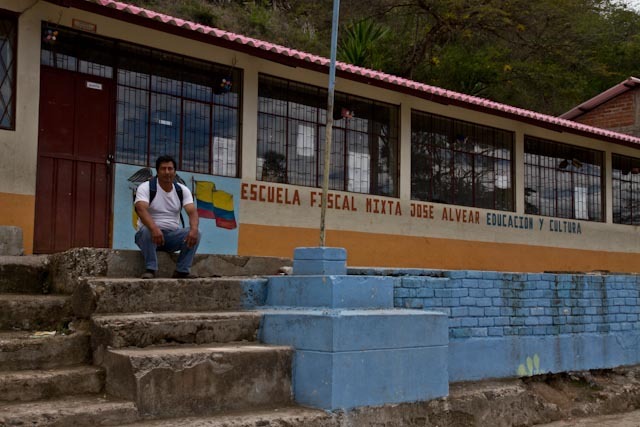 Pedro proudly showed us the school he attended up to 6th grade! His mother told us she attended school up to 2nd grade. Pedro's main goal right now is to get his high school diploma. He has five more months of study before his goal will be accomplished, and it will cost him almost $2,000. On our journey, we met Miguel who was sorting out his red onion harvest. 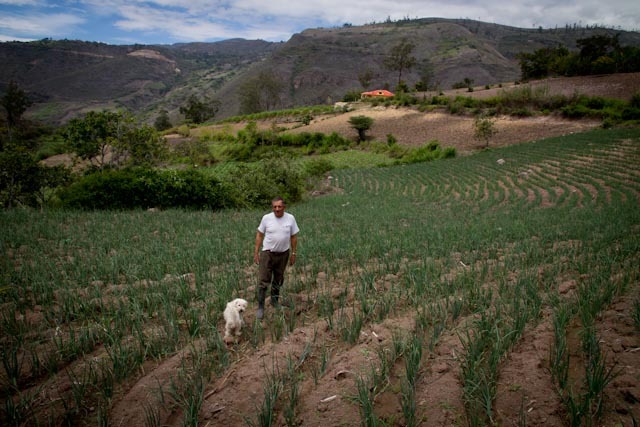 He had a huge field of onions still waiting to be harvested, which he proudly took us to see. 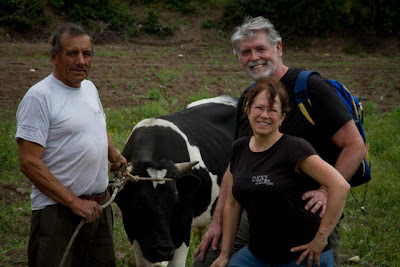 We posed by his "Torro" for another memorable photo. 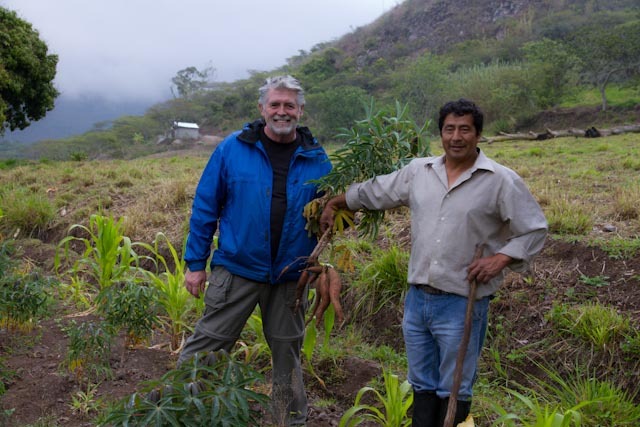 Pedro harvested fresh Yucca from his parent's land. 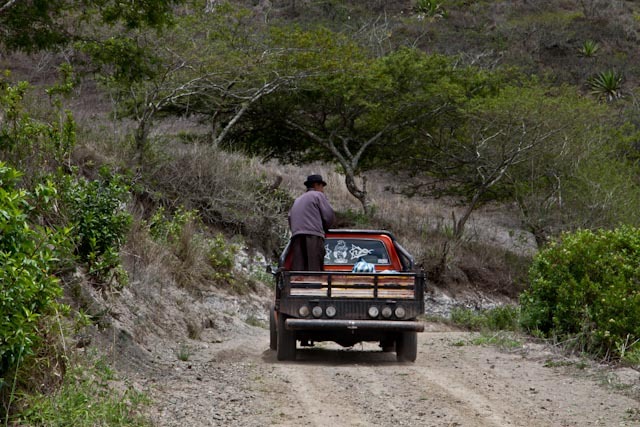 As we headed back to the house, we saw Sr. Salvador heading down the road into town. His day is very full from early morning to late evening, and for 76, he's an inspiration! Back at the house, Sra. Rosa and Olga had roasted a Cuy just for us. 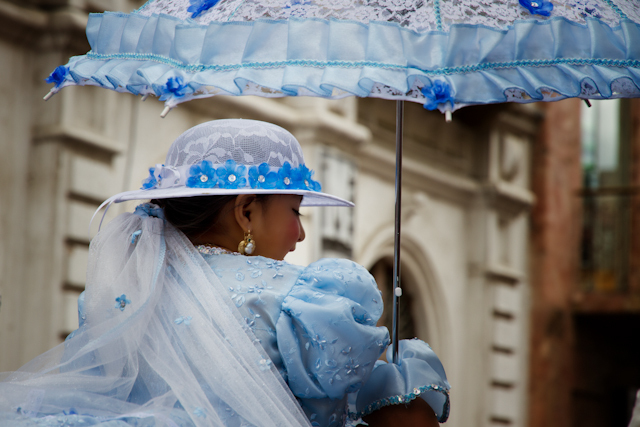 It is an Ecuadorian custom that without Cuy there is no celebration, be it a wedding, christianing, holiday, or visiting guests! They wanted to celebrate us!! 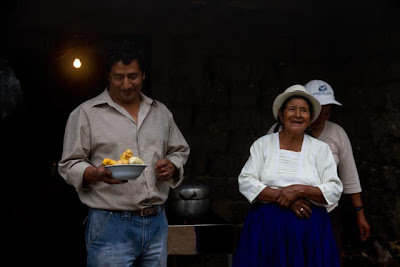 So the night before, Pedro and his mom picked the plumpest Cuy and killed, cleaned and marinated it, while Bo and I watched and listened to Sr. Rosa tell us all about the importance of this wonderful delicacy. 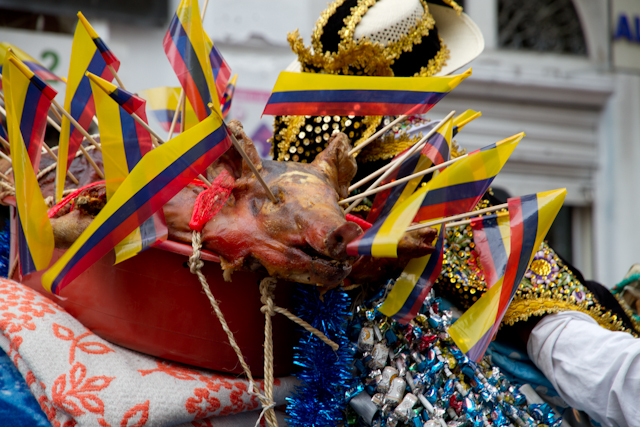 Pedro's family was having so much fun posing for pictures, and they even decorated the Cuy with Camote! They were also having fun teasing me saying, "Hoy es el dia de Linda Y Cuy!!!" 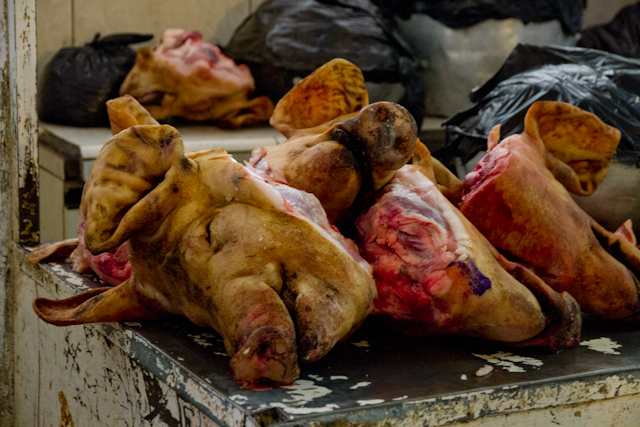 I never thought I'd see they day I would eat a Guinea Pig, but to have said "no" would have been rude. 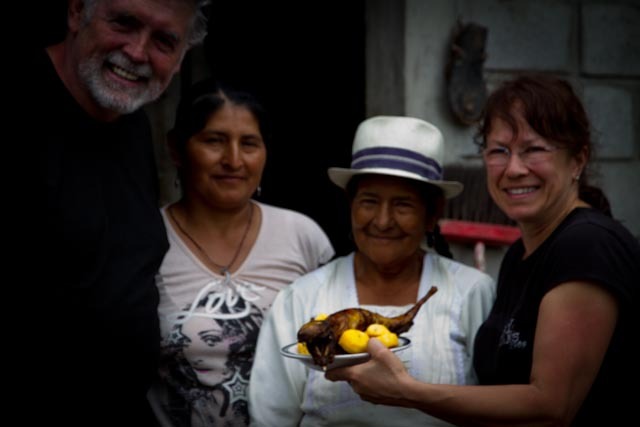 So, that afternoon, before heading home, Bo and I joined this generous family for their Cuy and Chancho feast in honor of our visit. I must say, it was delicious!!!! Though we don't have photos of everyone whom we met in the two days we visited, we ate with Pedro's parents, cousins, nieces, sister, and nephew, and that tiny house was packed with a lot of love, delicious food, and true Ecuadorian family!!!! We will forever remember our time with Pedro's loving and humble family. They have invited us back to celebrate the New Year with them......so more to come!!! 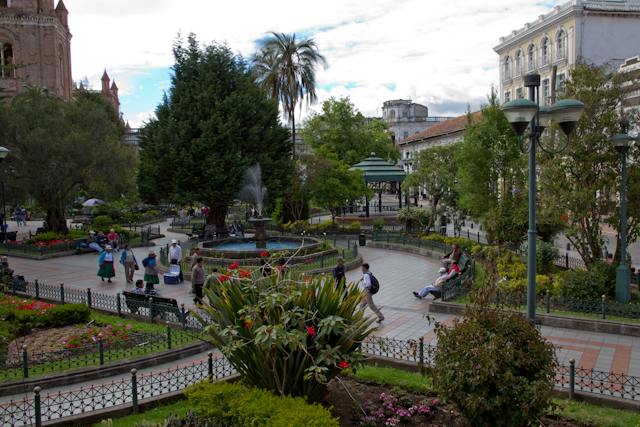 RENTING IN CUENCA ECUADOR - WE MOVED!